The economic development organizations in northwest Iowa are once again teaming up to bring the statewide Dream Big Grow Here business grant contest to our region. The Dream Big Grow Here contest is an opportunity for Iowans to fulfill their dreams of self-employment or expansion of their current business. The contest allows entrepreneurs the chance to submit their dreams to start or expand a business, then encourage friends, family, and customers to vote for them online. The finalists will present their idea to an audience and judges in a pitch-off event for a chance to win thousands in cash prizes. From now until January 31st, entrepreneurs in Cherokee, Lyon, Monona, O’Brien, Osceola, Plymouth, Sioux and Woodbury counties can submit their business or startup ideas to www.DreamBigGrowHere.com. Those submitting an idea will choose one of six industry categories from which to apply. The six industry categories include: Pre-revenue, Retail/Wholesale, Hospitality/ Restaurants, Ag Innovation, Professional Services, and Manufacturing/Bioscience/ Information Technology. Voting on the submitted ideas will take place February 8th to the 12th. During the voting period, the entrepreneur will recruit others to vote for their entry at www.DreamBigGrowHere.com. Five entries will be selected from each industry category to advance to the statewide contest at the statewide entrepreneurial conference, EntreFEST, in Iowa City on May 19, 2016. Each entrepreneur that advances in their industry category will participate in a pitch-off event against the other industry finalists for a chance to win $5,000. The winners of each industry category will then advance to the finals the evening of May 19th for a chance to win a grand prize to be announced at EntreFEST 2016. All entrepreneurs advancing to the statewide contest will also have access to the University of Northern Iowa’s Business Concierge services, as well as receive personalized coaching and mentoring from VentureNet Iowa to prepare their pitch. 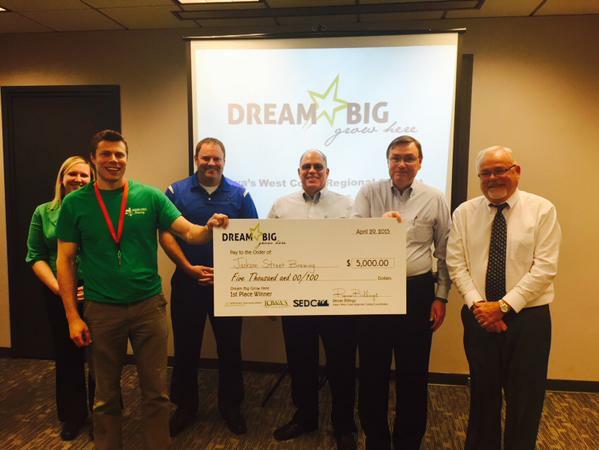 As an added bonus, the economic development organizations in northwest Iowa will also host a regional Dream Big Grow Here contest in April. This regional contest will allow the top five vote getters in northwest Iowa to refine their pitches, showcase their ideas, and compete in a regional pitch off event for $5,000. The regional contest winner in 2015 was Jackson Street Brewing, which is a local tasting room and brewery located in downtown Sioux City. Additional details about the upcoming regional contest will be announced in March. The Northwest Iowa regional contest is organized by the economic development organizations that are a part of Iowa’s West Coast Initiative and Northwest Iowa Developers and includes the following counties: Cherokee, Lyon, Monona, O’Brien, Osceola, Plymouth, Sioux and Woodbury. To learn more or to enter the contest, please visit www.DreamBigGrowHere.com or email rbillings@sioux-city.org.